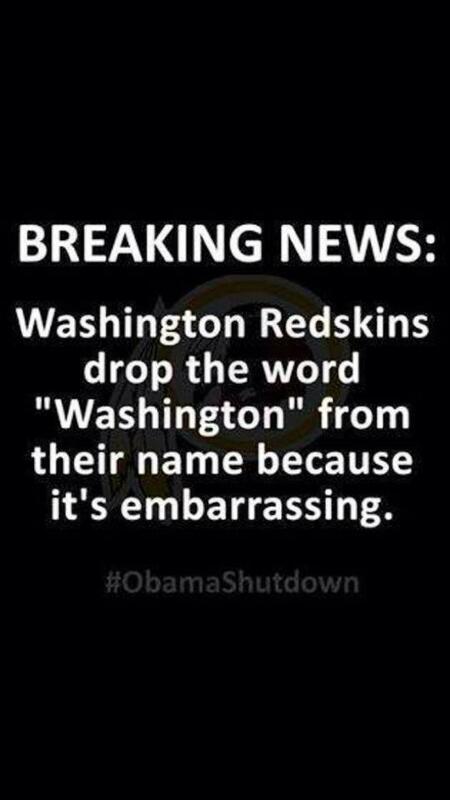 Have you heard the one about the Redskins changing their name? Full disclosure — I didn’t come up with that one. I got it from my son’s father-in-law (and my fellow grandfather) Hunter Herring. He posted the graphic below on Facebook a couple of days back. I don’t know where he got it. But I thought the #ObamaShutdown tag at the bottom was kind of weird, seeing that the joke seems to be more at the expense of Republicans, since they’re the ones being blamed by most people. But either way seems overparsing it. It’s really a joke on Washington. We’re pretty much embarrassed by everyone within the Beltway. About that question: Can words kill people? This entry was posted in Barack Obama, It's a joke!, Social media, Sports, The Nation, Words on October 16, 2013 by Brad Warthen. I always thought a good name for a sports team based in Washington would be the “Federals”. It has a logical relationship to the town, isn’t objectionable to anyone, and it even has the added benefit of a good nickname – the Feds. I can just hear it now on a broadcast. “The Mets have a tough test ahead of them today as the Feds have come to town looking to continue their dominance in the NL East.” The Feds are tough, and no one wants to mess with them. Instead we go the Washington Nationals, which has been shortened to the “Nats”, which sounds like the annoying little bug that you swat away. What a missed opportunity. So, again we get the tiresome meme that this is all “Washington’s” fault? Please. The people who drove this debacle are not from Washington; they’re from Texas, Minnesota, Iowa, and, last but hardly least, South Carolina. If it were up to Washington the deal would long since have been cut, but, just to take one of umpteen examples, the last attempt at a deal was scuttled by none other than Greenville’s own Jim DeMint. If you want to know what the problem is, people, don’t blame “Washington”; look in the mirror. First, David, it’s a joke. Second, I look in the mirror, and I don’t see anybody who would precipitate something like this. Or anyone who has voted for anyone who would have precipitated something like this. Jokes are funny, to the extent they are, because they resonate with truth. No, but see, he’s not. I think he’s saying the fault lies with the red staters who elected Tea Party nut jobs, not our “entitlement mentality,” although keeping government hands off Medicare does hint that the Tea Partiers are more prone to that than they think. The Tea Party and I are probably the polar extremes of the Republican Party. I told this joke at a business meeting today. Everyone laughed. Then several, speaking for all it felt like, said it was Washington’s fault. Since I told the joke, I corrected them, and said it was OUR fault. But then someone corrected me and said no, it is the fault of the South – and even more the Midwest. And he was probably right. Stop worrying about the Tea Party. After today’s deal, we’re back to normal. The Democrats own the health care system in the U.S., the Democrats and semi-Republicans own the debt and deficit, and Democrats and semi-Repubilicans own the economy. If things go well, they get the credit. If they don’t, just go back to blaming the fringe Tea Party. It’s a nice situation to be in. Basically, David is making the same argument that Cal Thomas did in his latest column. Which should give him pause. Thomas says it’s us and out “entitlement mentality.” Really, that’s what he said. Really, I shouldn’t say “worldviews,” because it’s singular. They all believe in the same thing — us vs. them. That would be inhibiting, though. I haven’t tried it, but I’m pretty sure I can’t go with a House delegation standing next to me. Truer words have never been spoken. If it were up to “our” elected officials in Washington, they would have cut a deal that allowed them to continue to spend OUR money at a breakneck pace. Yes, there would have been a deal, allright. But it would have been a bad deal for us. There was no “deal”. There was only a deal-ay. Kicking the can down the road once again to avoid making tough decisions. Too bad we can’t have a balanced budget amendment. That would eliminate half the battle. Then eliminate the debt ceiling altogether. It offers no real restriction on spending or deficits if you have to keep raising it.